It is a time of unrest in 1920s Europa. The ashes from the first great war still darken the snow. The capitalistic city-state known simply as “The Factory,” which fueled the war with heavily armored mechs, has closed its doors, drawing the attention of several nearby countries. 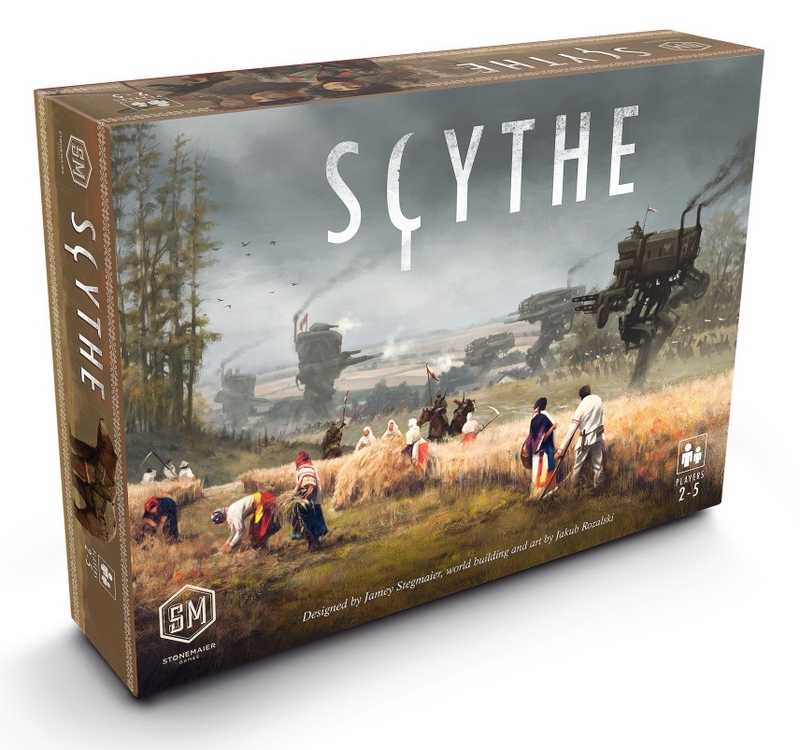 Scythe is a board game set in an alternate-history 1920s period. It is a time of farming and war, broken hearts and rusted gears, innovation and valor. In Scythe, each player represents a fallen leader attempting to restore their honor and lead their faction to power in Eastern Europa. Players conquer territory, enlist new recruits, reap resources, gain villagers, build structures, and activate monstrous mechs. Each player begins the game with different resources (strength, victory points, movement capabilities, and popularity), their choice of several faction-specific abilities, and a hidden goal. Starting positions are specially calibrated to contribute to each faction’s uniqueness and the asymmetrical nature of the game. Scythe gives players almost complete control over their fate. Other than each player’s individual hidden objective card, the only elements of luck are encounter cards that players will draw as they interact with the citizens of newly explored lands and combat cards that give you a temporary boost in combat. Combat is also driven by choices, not luck or randomness. Scythe uses a streamlined action-selection mechanism (no rounds or phases) to keep gameplay moving at a brisk pace and reduce downtime between turns. While there is plenty of direct conflict, there is no player elimination, nor can units be killed or destroyed. Every part of Scythe has an aspect of engine-building to it. Players can upgrade actions to become more efficient, build structures that improve their position on the map, enlist new recruits to enhance character abilities, activate mechs to deter opponents from invading, and expand their borders to reap greater types and quantities of resources. These engine-building aspects create a sense of momentum and progress throughout the game. The order in which players improve their engine adds to the unique feel of each game, even when playing one faction multiple times.